UM… EXCUSE ME, PRINC… GENERAL. Leia is our kind of princess. One of the youngest senators during the Galactic Empire (for as long as the Empire felt like having a Senate, anyway), Leia is a princess that gets things done. Sure, she does that typical “princess thing” of getting captured a few times, but she fights back and helps orchestrate her own escape each time. Even if it means a trip through the trash compactor or fighting a giant slug of a gangster lord, because the Force is strong with this one. 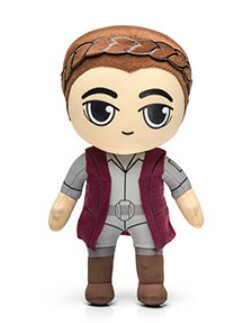 This plush features General Organa in the vest and pants we first saw her wearing in Star Wars: The Force Awakens. Because billowy and white is overrated when you have to get things done. The vest and braids are tacked on, so these are pretty safe with young folks, just maybe not infants and toddlers. Timmy might have to bring one with him to the screening of Star Wars: The Last Jedi, because he would have wanted her to see the finished product.